Domain Check – Which domains for the name are still available? With the Domain Check tool, all your words and names which you marked as favorite name ideas in My Names are checked regarding the availability of top level domains. Proper top level domains are extremely important for your business, whether you are an online start-up or a big company which has to perform a name change. So make sure that the most important top level domains for your name are still available when deciding on a new name! The Domain Check allows you to check the availability of a variety of top level domains with one click, ranging from international domains like .com and .org to country-specific domains like .de and .fr. If a domain is still available, you can immediately start the registration process. NameRobot leads you to several domain registration services which we can recommend. 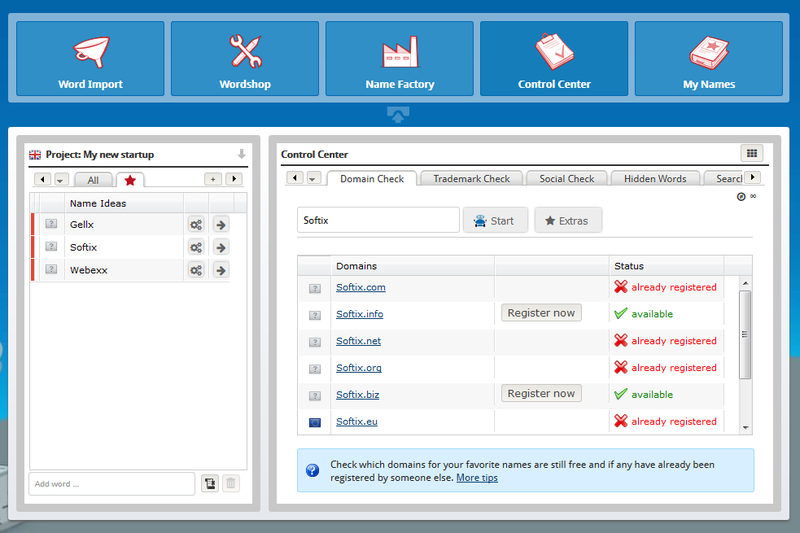 Check the availability of top-level-domains with one click. Go to the Domain Check in the Control Center right now to test it out! If you don't have a NameRobot account yet, simply register and start looking for a name! Note: The names mentioned above are only used as examples and have nothing to do with other possibly existing brands.